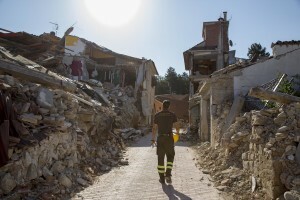 A firefighter walks among the rubble inside the red zone almost one year after the earthquake in the village of Amatrice, central Italy on August 1, 2017. 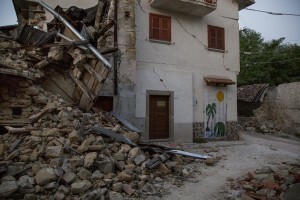 Italy was struck by a powerful 6.2 magnitude earthquake in the night of August 24, 2016 which has killed at least 297 people and devastated dozens of houses in the Lazio village of Amatrice and other Amatrice fractions. A general view of the red zone almost one year after the earthquake in the village of Amatrice, central Italy on August 1, 2017. 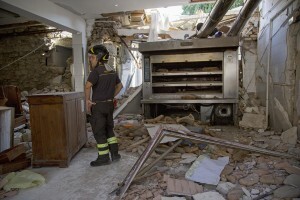 Italy was struck by a powerful 6.2 magnitude earthquake in the night of August 24, 2016 which has killed at least 297 people and devastated dozens of houses in the Lazio village of Amatrice and other Amatrice fractions. Firefighters help people to find their personal object inside the red zone almost one year after the earthquake in the village of Amatrice, central Italy on August 1, 2017. 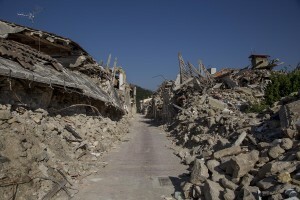 Italy was struck by a powerful 6.2 magnitude earthquake in the night of August 24, 2016 which has killed at least 297 people and devastated dozens of houses in the Lazio village of Amatrice and other Amatrice fractions. A firefighter works inside the red zone almost one year after the earthquake in the village of Amatrice, central Italy on August 1, 2017. 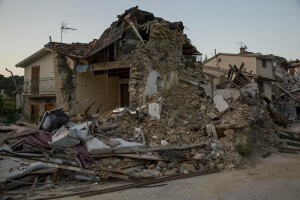 Italy was struck by a powerful 6.2 magnitude earthquake in the night of August 24, 2016 which has killed at least 297 people and devastated dozens of houses in the Lazio village of Amatrice and other Amatrice fractions. A collapsed building inside the red zone almost one year after the earthquake in the village of Amatrice, central Italy on August 1, 2017. 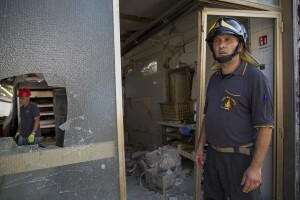 Italy was struck by a powerful 6.2 magnitude earthquake in the night of August 24, 2016 which has killed at least 297 people and devastated dozens of houses in the Lazio village of Amatrice and other Amatrice fractions. 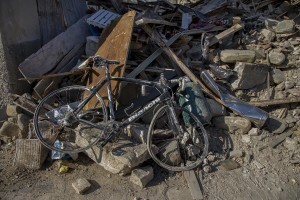 A destroyed bicylce is seen inside the red zone almost one year after the earthquake in the village of Amatrice, central Italy on August 1, 2017. 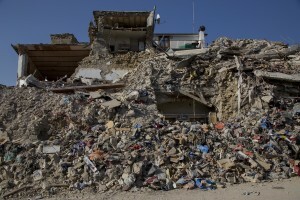 Italy was struck by a powerful 6.2 magnitude earthquake in the night of August 24, 2016 which has killed at least 297 people and devastated dozens of houses in the Lazio village of Amatrice and other Amatrice fractions. A car crushed by rubble is seen almost one year after the earthquake in the village of Amatrice, central Italy on August 1, 2017. 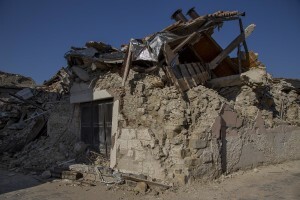 Italy was struck by a powerful 6.2 magnitude earthquake in the night of August 24, 2016 which has killed at least 297 people and devastated dozens of houses in the Lazio village of Amatrice and other Amatrice fractions. A collapsed building is seen almost one year after the earthquake in the village of Amatrice, central Italy on August 1, 2017. 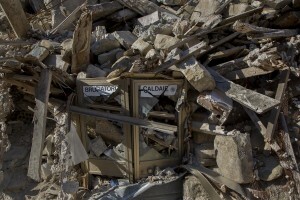 Italy was struck by a powerful 6.2 magnitude earthquake in the night of August 24, 2016 which has killed at least 297 people and devastated dozens of houses in the Lazio village of Amatrice and other Amatrice fractions. A collapsed building is seen almost one year after the earthquake in the village of Amatrice, central Italy on August 2, 2017. 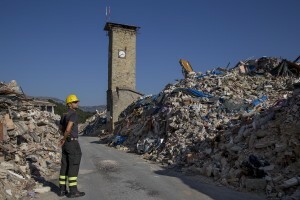 Italy was struck by a powerful 6.2 magnitude earthquake in the night of August 24, 2016 which has killed at least 297 people and devastated dozens of houses in the Lazio village of Amatrice and other Amatrice fractions. 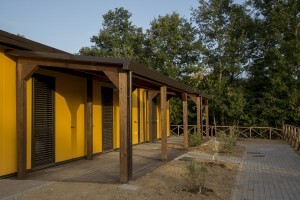 The new houses built after the earthquake of almost one year ago in the village of Retrosi, central Italy on August 2, 2017. 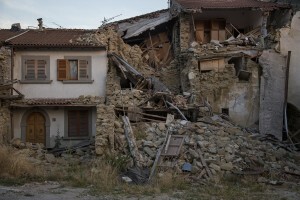 Italy was struck by a powerful 6.2 magnitude earthquake in the night of August 24, 2016 which has killed at least 297 people and devastated dozens of houses in the Lazio village of Amatrice and other Amatrice fractions. Maria Rita Di Sisto, 68 years old is portrayed outside the new house where she lives after her old one was destroyed by the earthquake of almost one year ago in the village of Retrosi, central Italy on August 2, 2017. 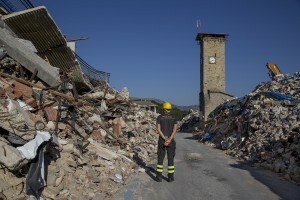 Italy was struck by a powerful 6.2 magnitude earthquake in the night of August 24, 2016 which has killed at least 297 people and devastated dozens of houses in the Lazio village of Amatrice and other Amatrice fractions. 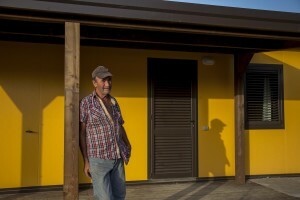 Enrico Laureti, 62 years old is portrayed outside the new house where he lives after his old one was destroyed by the earthquake of almost one year ago in the village of Retrosi, central Italy on August 2, 2017. 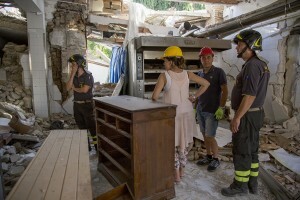 Italy was struck by a powerful 6.2 magnitude earthquake in the night of August 24, 2016 which has killed at least 297 people and devastated dozens of houses in the Lazio village of Amatrice and other Amatrice fractions. A collapsed building is seen almost one year after the earthquake in the village of Retrosi, central Italy on July 31, 2017. 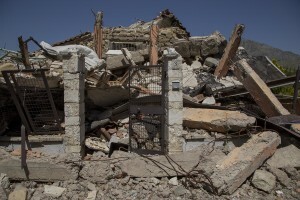 Italy was struck by a powerful 6.2 magnitude earthquake in the night of August 24, 2016 which has killed at least 297 people and devastated dozens of houses in the Lazio village of Amatrice and other Amatrice fractions. 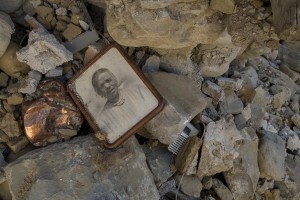 A photo is seen among the rubble of a collapsed building almost one year after the earthquake in the village of Retrosi, central Italy on July 31, 2017. 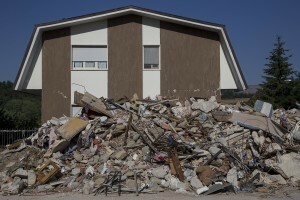 Italy was struck by a powerful 6.2 magnitude earthquake in the night of August 24, 2016 which has killed at least 297 people and devastated dozens of houses in the Lazio village of Amatrice and other Amatrice fractions. A collapsed building is seen almost one year after the earthquake in the village of Prato, central Italy on July 31, 2017. 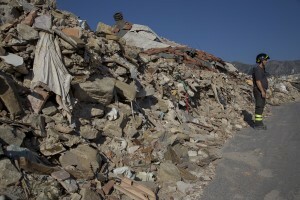 Italy was struck by a powerful 6.2 magnitude earthquake in the night of August 24, 2016 which has killed at least 297 people and devastated dozens of houses in the Lazio village of Amatrice and other Amatrice fractions. A collapsed building is seen almost one year after the earthquake in the village of Fonte del Campo, central Italy on July 31, 2017. 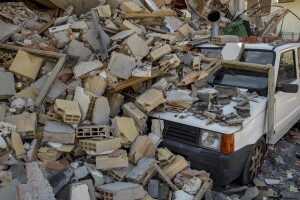 Italy was struck by a powerful 6.2 magnitude earthquake in the night of August 24, 2016 which has killed at least 297 people and devastated dozens of houses in the Lazio village of Amatrice and other Amatrice fractions. 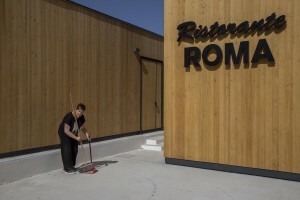 A woman works inside the food area almost one year after the earthquake in the village of Amatrice, central Italy on August 2, 2017. 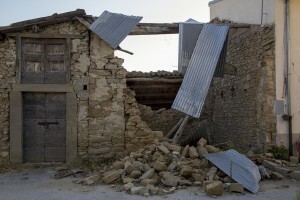 Italy was struck by a powerful 6.2 magnitude earthquake in the night of August 24, 2016 which has killed at least 297 people and devastated dozens of houses in the Lazio village of Amatrice and other Amatrice fractions. 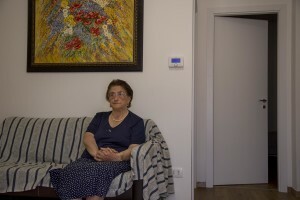 Concetta Renzi, 87 years old is portrayed inside the new house where she lives after her old one was destroyed by the earthquake of almost one year ago in the village of Amatrice, central Italy on August 1, 2017. Italy was struck by a powerful 6.2 magnitude earthquake in the night of August 24, 2016 which has killed at least 297 people and devastated dozens of houses in the Lazio village of Amatrice and other Amatrice fractions. 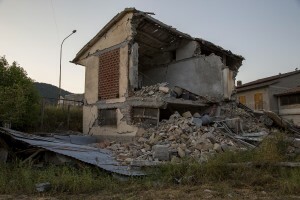 A collapsed building is seen almost one year after the earthquake in the village of Libertino, central Italy on August 1, 2017. Italy was struck by a powerful 6.2 magnitude earthquake in the night of August 24, 2016 which has killed at least 297 people and devastated dozens of houses in the Lazio village of Amatrice and other Amatrice fractions. 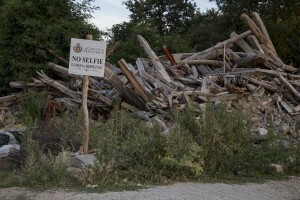 A panel with the slogan “no selfie” is seen among the rubble of a collapsed building almost one year after the earthquake in the village of Cascello, central Italy on July 31, 2017. Italy was struck by a powerful 6.2 magnitude earthquake in the night of August 24, 2016 which has killed at least 297 people and devastated dozens of houses in the Lazio village of Amatrice and other Amatrice fractions. 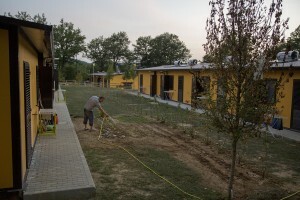 A man waters the plants outside the new house where he lives after his old one was destroyed by the earthquake of almost one year ago in the village of Amatrice, central Italy on August 2, 2017. Italy was struck by a powerful 6.2 magnitude earthquake in the night of August 24, 2016 which has killed at least 297 people and devastated dozens of houses in the Lazio village of Amatrice and other Amatrice fractions. Silvio Puglia, 49 years old and Rita Casini, 49 years old are portrayed inside the new house where they live after their old one was destroyed by the earthquake of almost one year ago in the village of Amatrice, central Italy on August 2, 2017. Italy was struck by a powerful 6.2 magnitude earthquake in the night of August 24, 2016 which has killed at least 297 people and devastated dozens of houses in the Lazio village of Amatrice and other Amatrice fractions. Daily life scenes in the area of the new houses built after the earthquake of almost one year ago in the village of Amatrice, central Italy on August 2, 2017. Italy was struck by a powerful 6.2 magnitude earthquake in the night of August 24, 2016 which has killed at least 297 people and devastated dozens of houses in the Lazio village of Amatrice and other Amatrice fractions. 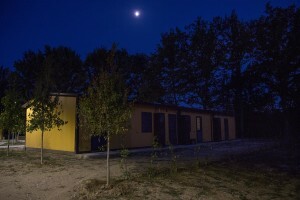 The new houses built after the earthquake of almost one year ago in the village of Amatrice, central Italy on August 2, 2017. Italy was struck by a powerful 6.2 magnitude earthquake in the night of August 24, 2016 which has killed at least 297 people and devastated dozens of houses in the Lazio village of Amatrice and other Amatrice fractions.